With charisma of glam world spreading all over, children too are no less aware of the current trend and style than the adults. From designer clothes to branded sunshades, they want to have everything that makes them look happening among their folks. But while parents are ready to buy a wonderful outfit, they are reluctant to purchase a pair of quality sunglasses for their child. Many couples think that in case of children sunshades are only fashion accessory and so kids do not actually need sunglasses. However studies have shown that eyes of children are little more sensitive to ultraviolet rays than the eyes of adults. Children need greater protection from sun because they spend long hours playing outdoors and encounter direct sunlight. The damaging effect of ultraviolet rays is high in case of children as the young eyes allow more of these rays inside. Moreover kids are careless, damage to their eyes through glare and dust particles in the air is quite easy. Therefore, eye practitioners contend that the sooner children start wearing sunglasses as they move outside, the better it will be for their eyes. According to them eyes of kids should be given complete care and protection from the tender age so that least problems occur in the later years of their lives. Exposure to sunlight at an early age can often lead to development of eye-cancer in future. Are there any special sunglasses for kids? Though the sunglasses for children are designed on the same pattern as those for adults, certain added features are found in the former. For instance the goggles for the young ones are made up of more impact resistant lenses with more durable and strong frames. This is because children are careless while playing and doing other activities; they can easily break a delicate pair of sunglasses. Also, as young age is full of life, colors and love for carton characters, the sunglasses for children are more colorful, trendy and sketched in comparison to those made for the grown-ups. Which Sunglasses are best for children? If you are a parent looking forward to purchase sunglasses for your child, there are two things you must look for prior to making a deal. Firstly ask for polycarbonate lens since this is more shatter-resistant. Secondly make sure that the sunglasses you buy for your child block or absorb 99-100 % of ultraviolet rays or the UVA and UVB kinds of it. Oakley offers latest and novel sunglasses for kids. Stu Apte provides a collection of fashionable sport goggles, which are ideal for Junior Water Sports. Similarly Smith Sport Optics parades a variety of ski-goggles for junior cold weather sports. The Bolle Kids Sunglasses are known for their great styles in kids' sunshades while the sunglasses by Vuarnet Kids Sunglasses are recognized for their beautiful nylon frames and strengthened temples that provide perfect protection to the young eyes in the sun. It is very important that parents should teach their child the correct use of the sunshades. 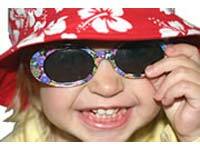 Children must know that sunshades are not to be worn 24 hours a day. But goggles are a must during the daytime particularly in summer season and between 10 AM to 2 PM as during this time the harmful ultraviolet rays are at their best. Children should also know how to keep their sunglasses safely and not to rotate or exchange them among their friends.